21 Savage is one of the more enlightened rappers. AFRICANGLOBE – U.S. Immigration and Customs Enforcement arrested Grammy-nominated rapper 21 Savage early Sunday morning, claiming that he is actually from the United Kingdom and overstayed his visa. 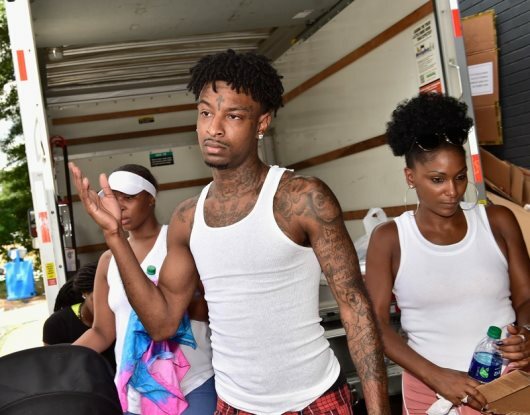 21 Savage, whose real name is Sha Yaa Bin Abraham-Joseph, was taken into custody in a “targeted operation” in metro Atlanta, ICE spokesman Bryan Cox said. Abraham-Joseph, 26, has claimed to be from Atlanta and has long been considered a local act. Just last fall, he gave free school supplies to more than 2,500 DeKalb County school students, the latest in a series of charitable ventures funded through his Leading By Example Foundation intended to “give back” to his community. Cox, however, said Abraham-Joseph is an “unlawfully present United Kingdom national” who came to the U.S. on a visa in July 2005. His visa expired a year later, Cox said. He was also convicted of felony drug charges in 2014 in Fulton County, ICE said. An ICE official said when Abraham-Joseph was arrested in 2014, ICE was not aware of his immigration status. They only learned later that he is allegedly from the U.K.
Abraham-Joseph, who spent much of his childhood in Decatur, has said publicly he was banned from the DeKalb County School District after he brought a gun to school, intending to use it on another student. Since then, after losing his younger brother and best friend to gun violence, he has become an advocate for gun control. In the spring of 2018, Abraham-Joseph was credited with launching the “paintballs up, guns down” social media campaign, which was intended to curb gun violence. Authorities said the campaign backfired, leading to a rash of paintball wars and, in some cases, deadly shootings. Around the same time the rapper began promoting paintball guns on social media, 3-year-old T’Rhigi Diggs was killed in a shooting in southeast Atlanta when a teenager retaliated with a real gun after being assaulted with paintballs. Abraham-Joseph stepped up to pay for the toddler’s funeral. Then, when gunfire broke out at a community event he was headlining in southeast Atlanta last fall, Abraham-Joseph spoke out again. He encouraged positivity and urged the people involved to set a better example for kids. The ICE official said Abraham-Joseph’s Sunday morning arrest stemmed from a traffic stop in DeKalb County, during which three other people were arrested by DeKalb police. 21 Savage performed in Atlanta as recently as Thursday in the Super Bowl Music Fest at State Farm Arena. He jumped into the rap game with his debut mixtape “The Slaughter Tape” in 2015. His most recent album, “I Am > I Was,” hit No. 1 on the Billboard 200 album chart. He is nominated for two Grammy Awards this year, one for record of the year and another for best rap/sung performance.